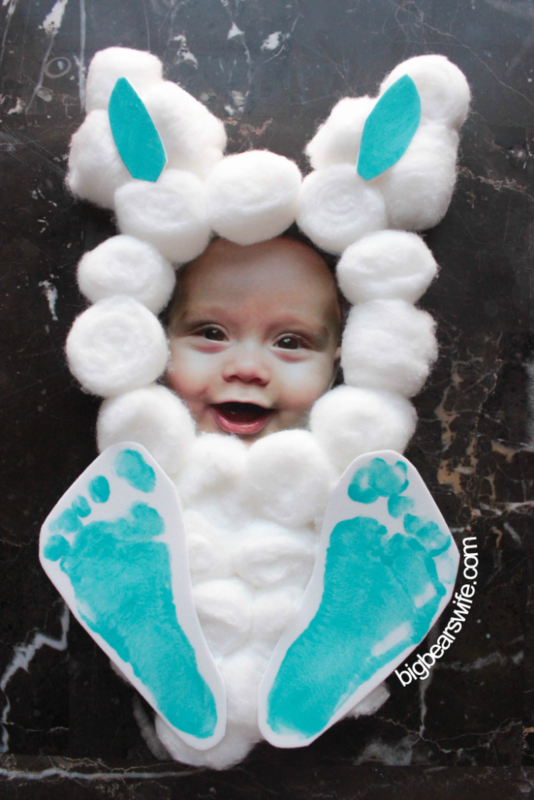 This adorable Easter Bunny Cotton Ball Photo Footprint Craft turns your little one into the cutest Easter bunny on the block! It takes just a few items from the craft store, a picture and about 10 minutes to create. 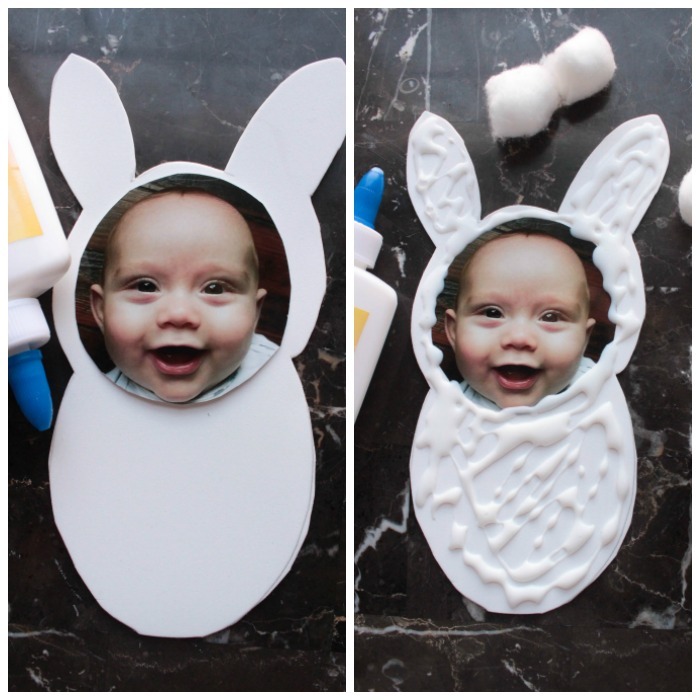 This little Easter Bunny Photo Footprint Craft DIY of Jackson is from his first Easter (last year) and I still have it hanging on my fridge because I love it so much. It was so quick to make and just turned out darling! I even made one for my sister in law and my mom! I originally just saw this idea on Facebook and it just had a photos with no directions so I just kind of had to figure it out. But it looks like a few other bloggers have made this kind of craft too (like Making thing Awesome & Thriving Home ) so I’m not exactly sure who to credit the idea to or where it originally came from. It reminds me of a craft we made in either pre-school when I was little. 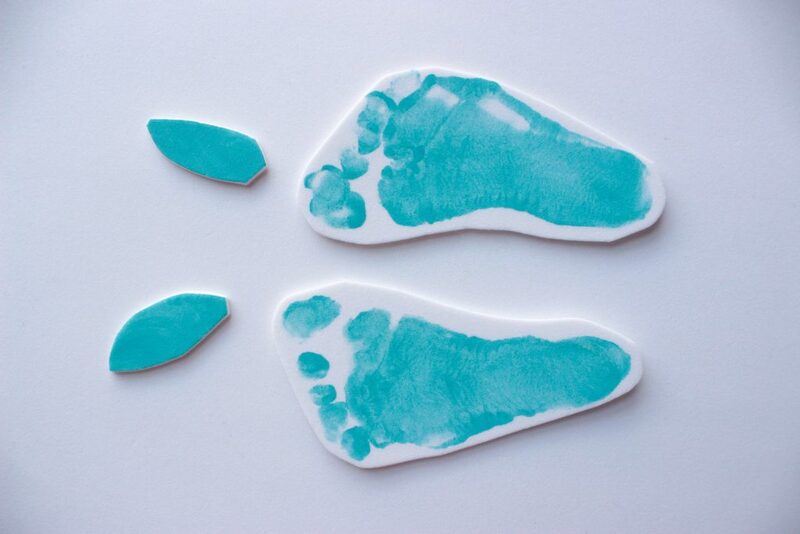 Use the paint to paint the bottom of child’s feet. Use a paint brush or a cotton ball. While paint is wet, press each foot onto 1 piece of white foam. Also paint two small patches on the foam for the ears. No need for this bunny to be perfect. 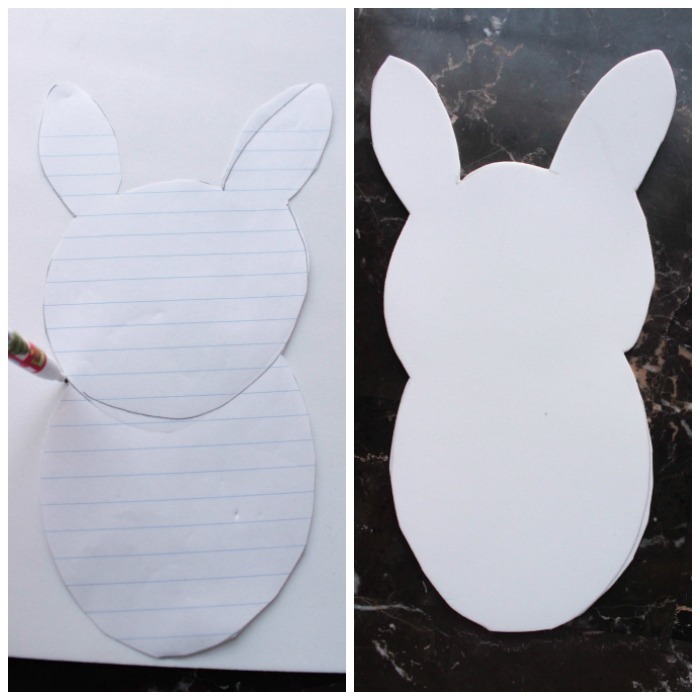 On a piece of notebook paper draw a circle for the head, an oval for the body and two ears. 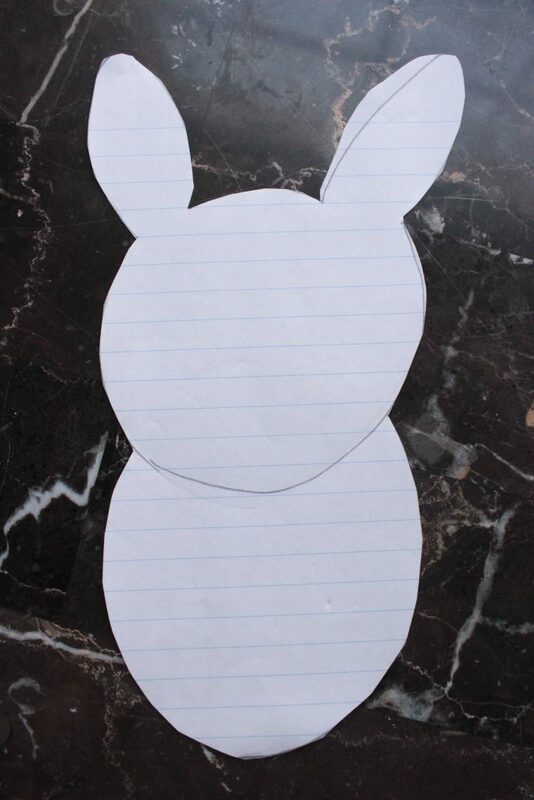 Use this to trace the bunny onto the 2nd foam sheet. Like I said, no need for it to be perfect because it is going to be covered with cotton balls anyways. 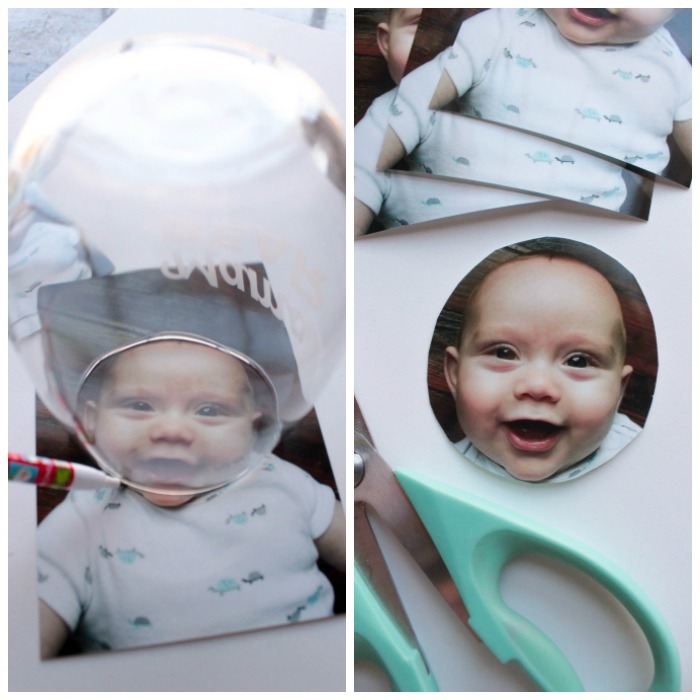 You’ll need somewhere of a close up shot of your kid for this project. I just snapped a new photos of Jackson with my phone, uploaded them to Walgreens and had them so the 1-hour photo printing when I made these. Target, CVS and Walmart also normally have 1 hour photo printing too. Just cut out the face. I used a glass as a guide so it would be a circle. Then glue the face onto the face of the bunny. 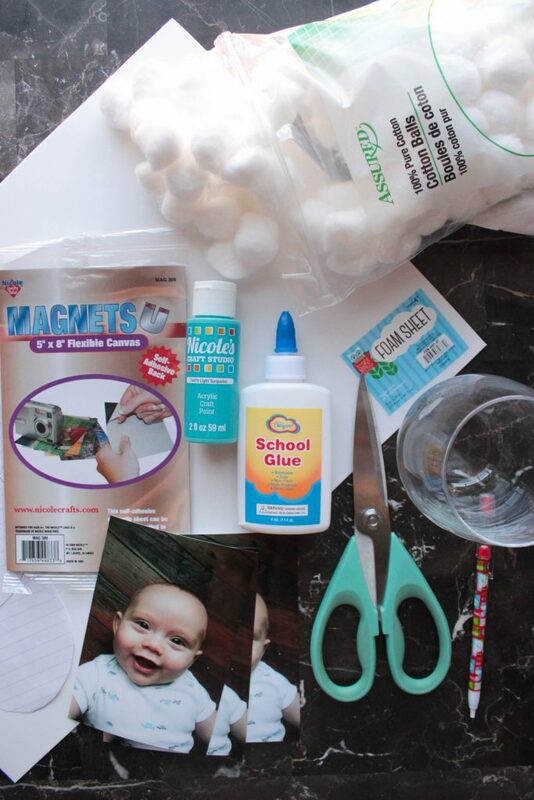 Apply a layer of white glue all over the foam and start sticking on the cotton balls. 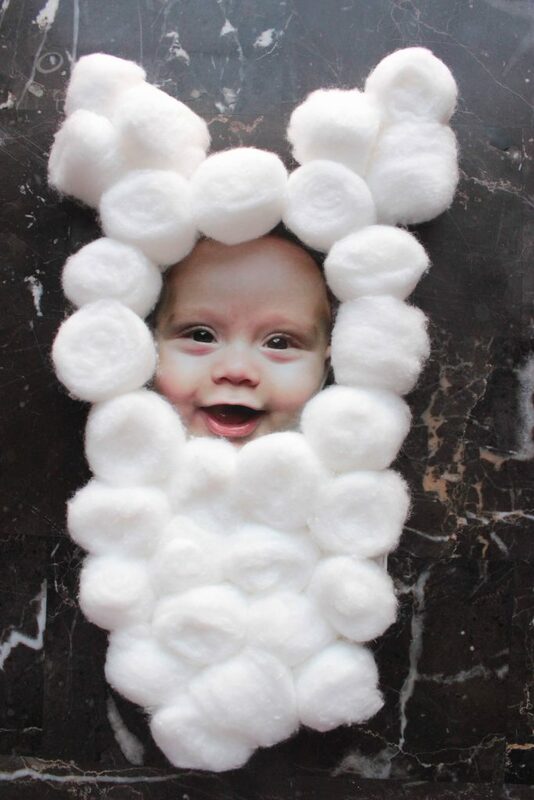 Cover the entire bunny with cotton balls. Some of the tutorials I found this year get you to use feet for the ears too but I thought that was just too much. So I just cut out little pieces of painted foam to go inside of the cotton ball ears on Jackson’ bunny and then I glued his feet to the bunny as it’s feet. Then you’re done! OR if you want to you can add sticky magnets to the back to make this into a magnet for the fridge which it what I did. I love it so much! I love to see what your making from the blog!